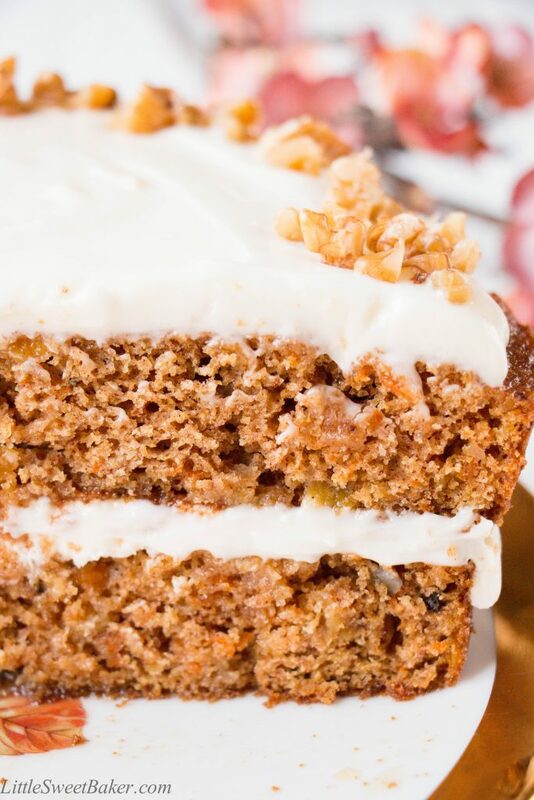 This healthy version of a classic carrot cake tastes anything but healthy. 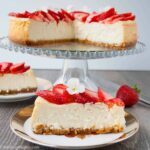 It’s moist, tender, perfectly spiced, and topped with the most delicious sweet and tangy yogurt cream cheese frosting. 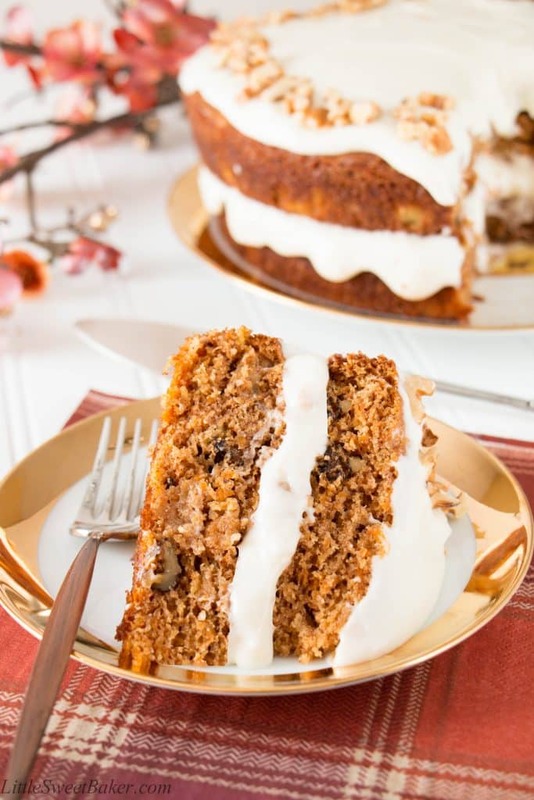 This cake is made with whole wheat flour instead of white flour, and a tiny bit of coconut oil, and the sugar is reduced by substituting part of it with maple syrup. 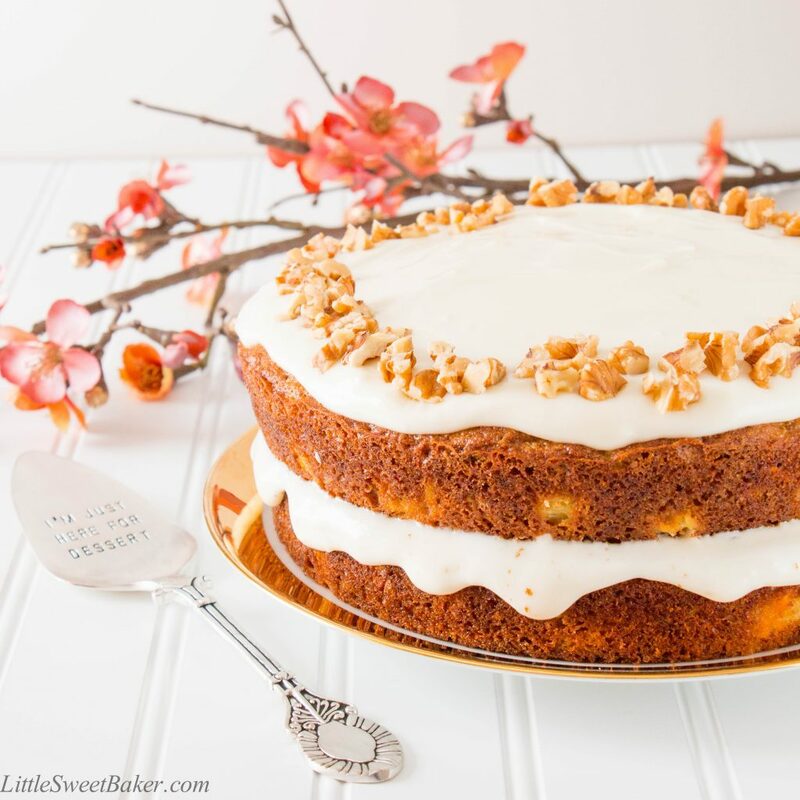 Yet all the taste and texture that you love from a traditional carrot cake remains. Honestly, if I didn’t tell you this cake was healthy, you would not know the difference. This cake is even better the next day as the frosting sets a bit firmer onto the cake, which makes this a great make-ahead dessert. 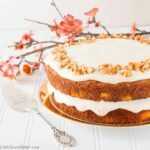 You can simply prepare the entire cake the day before, and keep it in the fridge until ready to serve. 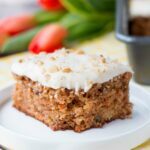 This healthy carrot cake is moist and tender with the wonderful taste of cinnamon. It’s filled with fresh carrots, pineapple chunks and chopped walnuts. Each layer is topped with a smooth and sweet yogurt cream cheese frosting. Enjoy this cake with your family and friends, but don’t tell them that it is healthy until after their first bite. Then watch the surprised look on their faces as they are in absolute awe of your dessert. Preheat oven to 350F and grease two 9″ round baking pans. In a large bowl, toss together the flour, baking soda, baking powder and cinnamon. In a medium bowl, whisk together the coconut oil, sugar, eggs, maple syrup and yogurt until smooth. Add the wet ingredient to the dry ingredients and stir until just combined. Fold in the carrots, pineapples and walnuts. Divide the batter into the two prepared baking pans. Bake for 25-30 mins or until a toothpick inserted into the center comes out clean. Using an electric mixer or stand mixer with paddle attachment, beat the cream cheese with the yogurt until well blended. Slowly add in the powdered sugar and mix until smooth. Chill in for the refrigerator for a minimum of 2 hours before spreading onto cooled cake. 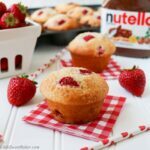 I’ll be sharing this at Fiesta Friday #138 hosted by Angie, co-hosted by Mollie@TheFrugalHausfrau and Johanne@FrenchGardenerDishes.